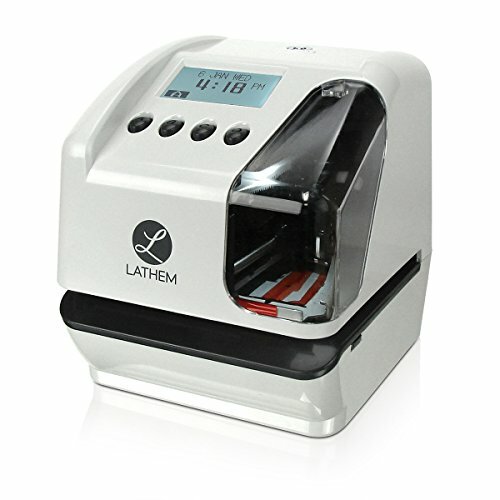 The Lathem LT5000 is a revolutionary new electronic time stamp that features patent-pending two-line printing and fully customizable text messages to support any document stamping requirement. Configure up to four different print sets and choose which one to print on the fly using push buttons on the case. Customize the date and time including 4-digit years, 24 hour or 1-12 AM/PM , regular minutes, tenth of an hour and even seconds to fit your exact needs. For unique document identification, a programmable 8-digit number can be appended to any print set and configured to advance and repeat based on your requirements. All print formats and custom text messages can be configured online, and programmed to the unit using a standard USB flash drive eliminating complex button setup. The highly accurate time base +/- 15 seconds per month uses Smart Clock functionality which adjusts automatically for DST, automatic month changes, leap year and keeps all time and settings during power failure. Other features includes English, Spanish, French, German and Portuguese print language selection, internal LED light, adjustable margin setting and a built-in paper positioning guide. A heavy-duty print mechanism supports up to half a million imprints, and an optional UPS battery allows for full operation for up to 24 hours or 200 prints during power failure. Black ink ribbon included, with red, green and purple ribbons available separately. A key locking case and programmable passcode ensure tamper resistant security. 1 year manufacturer’s warranty. Since 1919, Lathem time clocks have set the standard for quality, durability and accuracy. If you have any questions about this product by Lathem, contact us by completing and submitting the form below. If you are looking for a specif part number, please include it with your message.